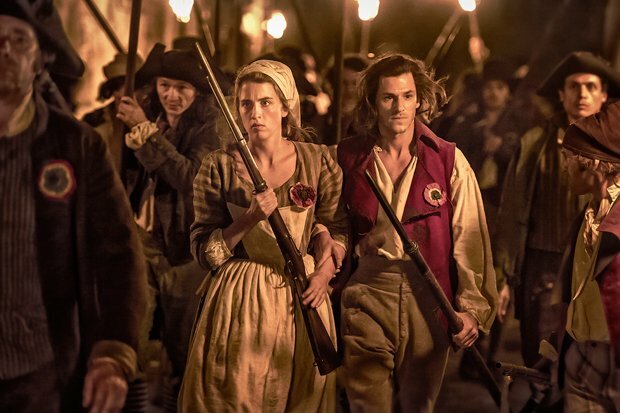 Quickly following Mike Leigh's Peterloo is an account of the early years of the French revolution that also honours working men and women fighting for change. And, like Peterloo, it's a predominantly talky affair – intelligent and absorbing, but not particularly stirring. One shouldn't expect the panache usually associated with French period drama. Writer-director Pierre Schoeller opens with the storming of the Bastille in July 1789 and the creation of the National Assembly, moving towards the formation of the Republic a few years later and the execution of King Louis XVI. There's very little action, with the taking of the Bastille and other violent confrontations occurring off screen. There is one exception: a massacre of demonstrators ordered by the Assembly itself, a bitter presage of the Reign of Terror and the murderous infighting to come. The introduction of the guillotine will send a shiver down the spine. Laurent Lafitte makes a proud king, Louis Garrel a thoughtful Robespierre. But the film is most enlivened by the actors playing working class rebels: Olivier Gourmet as a glassblower; Adèle Haenel, a washerwoman who loses a child through malnutrition and becomes a strong advocate for women's rights; and Céline Sallette, whose singing rouses both her character's comrades and the film itself. Despite the copious dialogue, this could easily confound anyone without a strong grasp of French history. Yet, with its themes of national identity and the empowerment of women, it couldn't be timelier. The story of the French Revolution, from the storming of the Bastille to the execution of Louis XVI. It’s talky, intelligent and absorbing and without the panache one usually associates with French period drama, but its themes of national identity and the empowerment of women couldn’t be timelier.